And that, it has to be said, is partly true. I grew up in Co. Meath. Good grass in Meath. Nice rolling hills, soft rain and a decent bit of sunshine (as far as "decent sunshine" in Ireland goes...). Perfect for sheep. It was a reasonably seasonal occurance, in fact, to get a call from about a mile down the back road from our local sheep farmer asking us to step out onto the road and scare any sheep back down it who might venture onto the "main road" beyond our house. We'd all pile out with our wellies on, with sticks or bells or anything to wave and watch a flock of sheep undulating towards us before spotting us, and doing almost balletic twirls and trotting back the way they came. 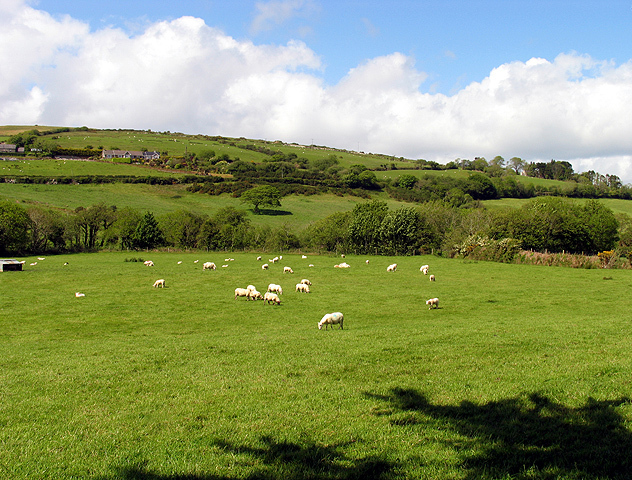 So, when foreigners express dismay that the country isn't covered in about three metres of fluffy sheep, I can see why. Some parts are, and they're usually the parts that get photographed for postcards. But, that's not the point I want to make, here. 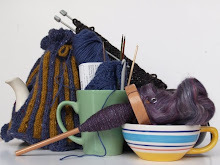 There is a lot more to Irish fibre arts than our wooly friends and a Fibre Fun Friday regular and friend of mine realised recently that there are few, if any real resources for people wanting to get a comprehensive view of fibre arts in Ireland. 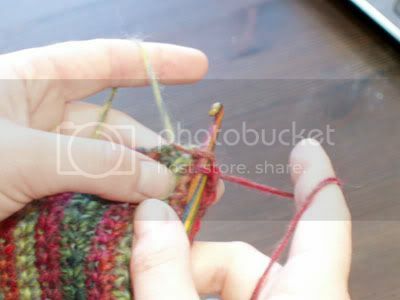 In response to this, she's started putting together a blog, documenting all the yarny wanderings of us Irish craft bloggers; covering what we're all doing, blogging about, news of events and resources. So far, I have to say I'm well impressed. It's still a work in progress, and already it's brimming with links to blogs, etsy shops and information on groups in both Dublin and Galway. I just found out yesterday that a lady, who made an Etain Shrug got a 1st place blue ribbon at her county fair. So very happy for her, and, by extension for me! 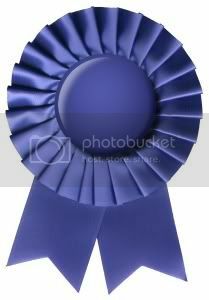 I think this is my first ever vicarious ribbon-win. It was my birthday last week. Hold the cheers; I'm not looking for attention! 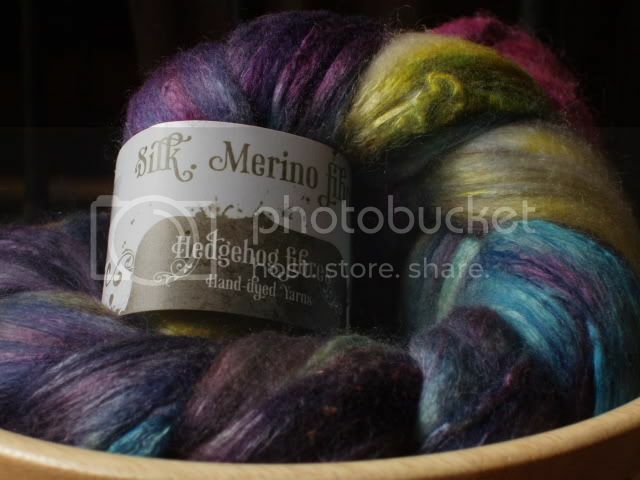 I mention it only because my lovely boyfriend got me some very delicious Hedgehog Fibre in two beautiful colourways. 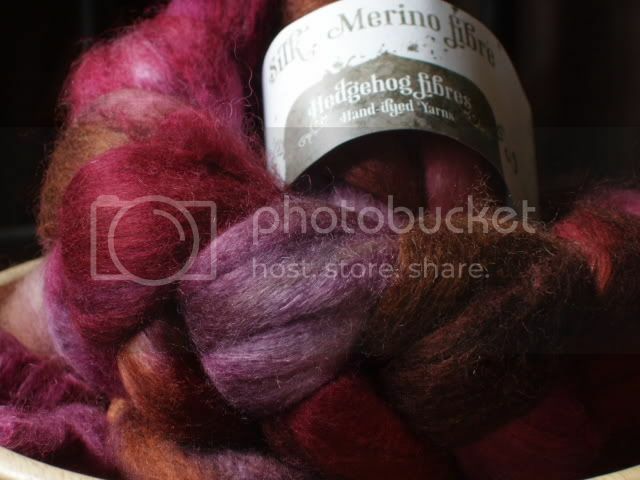 Silk and Merino. Spins like a cloud and stays so soft when plied. It was placed in my fibre-hungry paws with the express understanding that anything I made out of it should be for me. No giving it away. Mine. Like I'd give luxury like that away! Ha! He was serious about this, though. No gifting of Finished-Objects. He knows this is a thing, you see. He's witnessed me coming home from Fibre Fun Friday squealing about surprise hand-knit socks that were only my stash yarn a few weeks previously. 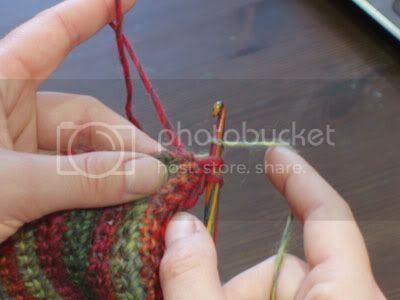 The practice of gifting a craft supply, having it be enjoyed, and the finished object handed on to a worthy third party, or back to the giver, is fairly common in yarny circles. Usually, it's just a token. Like, you get roving, spin it up, make something small for the gifter and keep the rest for yourself, but it's a very honourable tradition, I think. What better way to ensure someone knows you love their present than to show them you've used it, enjoyed it and spent time making them something out of it? It's the pay-it-forward of the fibre world and I think it shows us all for the lovely, kind-hearted souls we are! Or, is it that we're all so devious we know that giving presents to present-givers is one of the best ways to ensure future fluff gifts? As the saying goes, there are only two things in life that can be counted upon; death and taxes. I have to add a corollary for all yarn-lovers out there. Death, Taxes, and an inability to find a measuring tape when you need it. I've just spent about 20 minutes rooting around the apartment, pecking into corners like a hungry chicken, up-ending couch cushions and disturbing the boyfriend's peace and tranquility to find one of about seven measuring tapes I KNOW are in here somewhere. They have to be here. I had one yesterday, but it's now nowhere to be found. I'm becoming convinced that there is a blackhole somewhere in my home which tape measures and darnings needles trot towards in the dead of night. So, I got to thinking how else one could go about doing a quick measure calculation of length in the perpetual absence of a measuring tape. For me, I have always measured a metre as being from the tip of my fingers, along my outstretched arm, stopping at my other shoulder. I test this regularly, and I'm always around 99 to 101 cm. That's grand for me if I have to leave a long tail on a project. 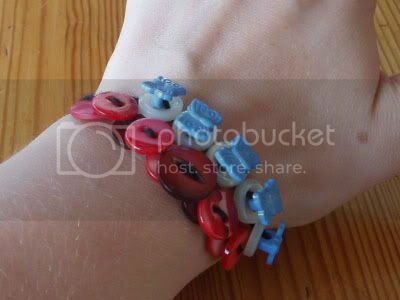 Also, my wrist to my elbow is as close to a foot as makes no odds, so there, too, I'm sorted. But if, like now, I need a fairly accurate reading of, say... 4 inches/10cm for tension purposes, what do I do? I have no tape to make this easy, so I have to go rooting aound for anything that is easily converted to 10cm without being able to check. 1 A4 size page, folded along its short edge is 10.5 cm. The length of a USB key pluggy-in-bit is 1.2cm. Multiply that by 8 and you get 9.6cm. The tip of your thumb to the middle of your first knuckle is approx 1 inch. The short side of a credit card is 5.5cm, but if you ignore the slight curve on the edge and measure only the straight line, it's 5cm. a European 5 cent piece is 2 cm in diameter. a bohemian blade if 2cm tall. But, possibly my favourite measurement is the truly archaic "barleycorn". Not only is this the measurement used for shoe sizes - so a size 4 is one barleycorn smaller than a size 5 - it's also one of the roots of the inch measurement. The Anglo-Saxons said the going size of an inch was three barleycorns. This was later written down with more accuracy by Edward II of England in 1324, when he announced once and for all that "three grains of barley, dry and round, placed end to end, lengthwise" constituted an inch. So, if you have a field of barley close at hand, you can go back to basics. 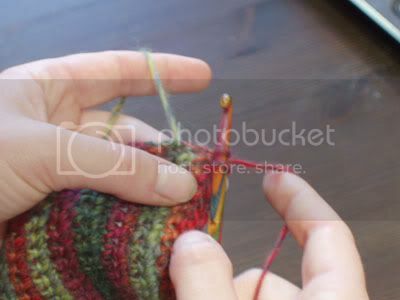 If you're anything like me, then you're a reasonably intelligent person ordinarily capable of counting your way well towards infinity...unless you have yarn in your hands. Then, anything after the number 4 - or 5 on a good day - is a struggle. 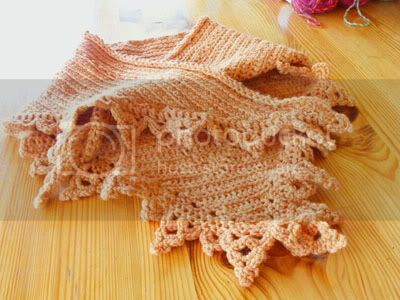 Ask me to keep account of 23 rows of crochet, and I turn into a bit of a sieve-headed cheese brain. I have a few ways of sorting this problem out. I will wear lots and lots of hair bobbins on one hand, transferring them one by one, row by row onto the other hand. Assuming I have 23 bobbins, a free hand means all the rows are done. 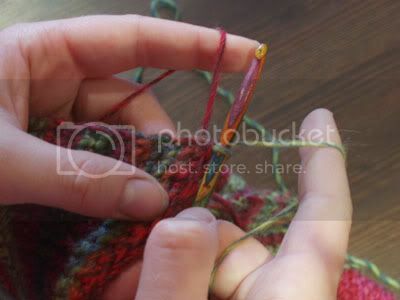 But 23 bobbins can sometimes cut off the blood circulation, leading to numb fingers and an inability to crochet. So, I've made myself a row counter. Basically, a mini, portable abacus. With butterflies! I took a bit of string, folded it in half and tied a knot close to the fold, making a small loop. 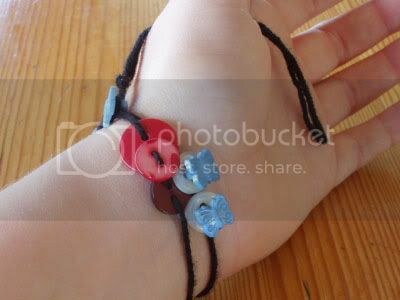 Secondly, I threaded one end of the string with 10 red buttons. In one hole, out the opposite one to make sure they will slide back and forth, but not too loose that they'd move freely. 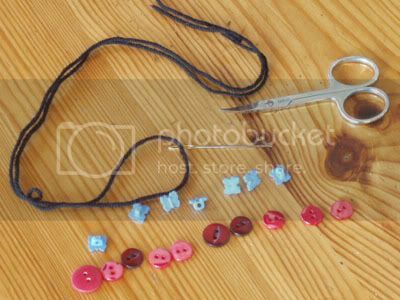 To the second string, I added 5 white buttons, with these pretty little butterfly beads on top. Finally, I threaded both strings through another butterfly, knotted the ends together and slipped this butterfly through the loop to make a bracelet! 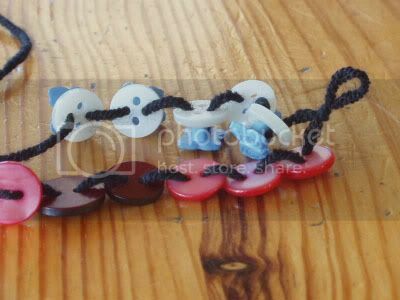 I've left a long strand free to hold the bracelet in place while you move the buttons back and forth to count rows. 1 red button = 1 row. 1 butterfly = 10 rows. So, as I have mentioned, I'm on my second doggy-minding adventure. This one has come about because a family member's a little under the weather, and the dominoes have fallen in such a way that I get to mind Nell for the week or so. 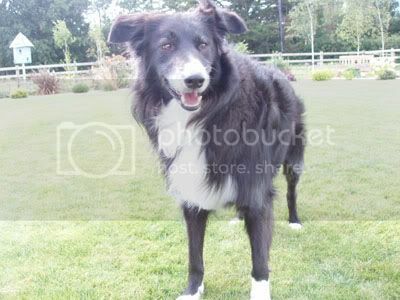 And therefore, I find myself once again, in the country, with a dog! Until this morning, though I was devoid of internet access, and boy, was it tough. Still, as my brain slowly went stir-crazy, relying on crochet - to keep me from getting bored or frustrated with Nell's manic love of playing "fetch" - was essential. Vital, even! Honestly, without my hooks and yarn, I'm sure my teeth would have got itchy, and I'd be in a tinfoil hat right now. To look at the kitchen here, and all the half-finished projects scattered around, one would believe I've been here longer than 4 days! 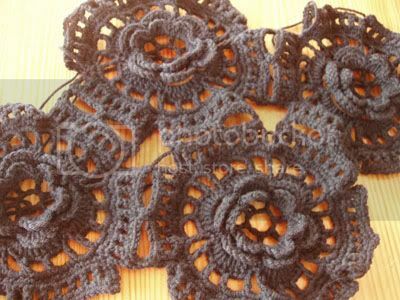 There's the test patch for a crochet heirloom blanket. Winter project, maybe? The individual motifs are at least interesting, and while this WILL get boring towards the end, it's a project that can be put away and pulled out when I feel like it over the years. No stress. No deadline. No worries. Secondly, there's a hooded jumper I've had in my head for a while, and "discovered" myself making two days ago. Right now, I have one half of the front and a sleeve done, with a lovely raglan line up the side. It's drapey too, which is awesome. Well done, yarn! Recognise it? Yea. It's one of those projects that just has to skip the line to the front of the WIP queue. It just sailed on past the gloves, and the long-suffering projects standing, shivering in the cold outside the club. There's the pair of socks for my sister which has been waiting a... year and a half to be finished. And the scarf for the boyfriend which was part of last year's Christmas stash, and that er, OWLS jumper. Remember that? I suspect that last one will be waiting some time before it gets to boogie on down with the other FOs. And this got me thinking. What makes a project into a queue-skipping, go-faster-stripe wearing, turbo-powered project with warp drive? For me? The conditions have to be right. I have to be just engaged and just bored enough to focus on one thing instead of the usual three or four. 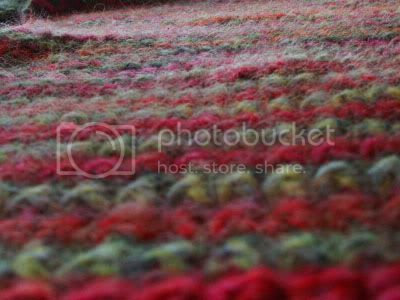 The yarn has to be special; Either hugely luxurious, deeply coloured or home-made somehow. What about you? What criteria do you have to push a project to Mach 1?